These delightful little gems make lovely holiday gifts. 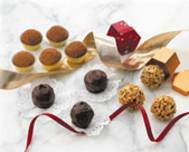 Nestle them in tiny gold paper cups and pack in pretty boxes for a festive touch. But be forewarned, these are so delicious, you might not want to give any away! In heavy saucepan over low heat, melt chocolate and butter. Combine whipping cream and vanilla; gradually blend into chocolate mixture. Stir in 1/2 cup chopped peanuts. Carefully place pan in a shallow bowl of ice water; stir chocolate mixture until completely cool and slightly thickened. Beat 20 to 30 seconds. Cover; refrigerate until firm. Form mixture into 24 small balls; roll each in finely chopped peanuts or cocoa powder. Or, to dip in melted chocolate, refrigerate balls until chilled. Dip balls, one at a time, turning to coat all sides. Place on waxed paper. Let stand until chocolate is set. Makes: 24 truffles (2 truffles per serving).